GREYCORTEX has released the latest version of our MENDEL network traffic analysis solution. 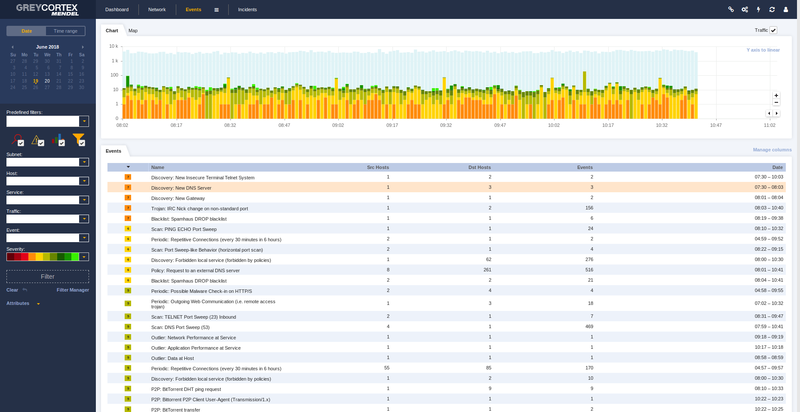 Version 3.1 has several important new features which improve detection and response for the network security team including default false positives, a new NetFlow module, and integration with external devices. Read further for a more detailed description of the newest features. A new, redesigned false positive manager dialog for improved user experience, including default false positives and host tagging, saving time in false positive creation, and improving accuracy across like devices. Added a new Netflow module to process NetFlow data from existing infrastructure more quickly for users with multiple, smaller locations like branch offices where a full MENDEL sensor may not be practical. Enhanced the plugin system for reporting events into external systems like routers, firewalls, as well as the use of custom and parameterized scripts, so users can take actions like blocking offending communications via firewall directly from the MENDEL interface. A new standard color scheme with additional interface improvements.